OfficeMax Mexico was able to dramatically increase Likes and engagement on its Facebook fan page in a short time, at a low cost by using Deal Maker Pro. To increase Likes and engagement on social media in order to reach a wider online audience. Ran a weeklong contest using Vionic’s Deal Maker Pro application. How Did OfficeMax Mexico Do It? OfficeMax Mexico provides top, trusted brands for office products, technology and office furniture, so that customers can maintain a more organized office, classroom and home. To post more engaging content in order to earn more Facebook Likes and stir up activity on OfficeMax Mexico’s social media pages. To go about this, OfficeMax Mexico turned to Vionic. 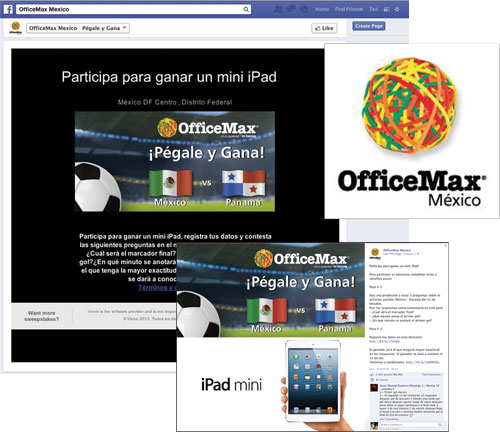 OfficeMax Mexico created a Facebook contest using Vionic’s Deal Maker Pro application. To enter the contest, Facebook users had to enter the following: 1. First name 2. Last name 3. Email 4. Responses to questions regarding the México vs. Panamá soccer match. The contest included a Like Gate, which required participants to Like the OfficeMax Mexico Facebook page in order to enter to win. Requirements 1-3 allowed OfficeMax Mexico to build a potential customer database. The fourth requirement encouraged participants to actively engage on the page about a time relevant topic. OfficeMax Mexico saw a dramatic increase in Likes and engagement in a mere week.